Oil field workers have some of the most highly stressful and dangerous jobs in the United States, and each year, thousands of people are injured or killed as a result of oil field or big rig accidents. The companies responsible for wrongdoing that has led to injury-causing incidents make millions and millions of dollars by cutting corners on safety and providing poor training to employees. Most of these businesses do not care about preventing injuries and do not care about treating people fairly after they have been injured on the job. These companies only care about their bottom lines. After an accident, it is important that you work with a North Dakota big rig and oil rig attorney from our team right away. After an injury, hiring the right firm can make all the difference in the outcome of your case. If you hire a firm with incompetent attorneys or lawyers who practice other types of law but have no experience with the oil industry, then you may not have a chance at success. Insurance providers and companies look for weak links in your case, and the wrong law firm may make significantly costly mistakes. After an accident, it is absolutely essential that you retain the representation of an aggressive lawyer from Lenahan Law Firm right away. Our North Dakota big rig and oil rig attorneys can help you obtain the compensation that you deserve and challenge negligent companies. If you have suffered a severe injury or loss because of a negligent oil company or an 18-wheeler accident, it is important that you work with an attorney who can fight for your rights and help you pursue the compensation that you deserve. Every lawyer you speak with will want you to hire them, but you should not settle for less than the skillful representation you deserve! You need to work with an attorney who focuses on catastrophic injuries and who has a reputation for success. 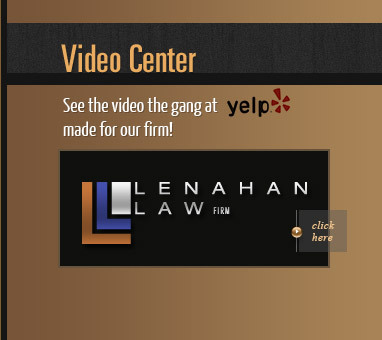 At Lenahan Law Firm, we are proud to be nationally renowned as aggressively legal advocates on behalf of our clients and we may be able to assist you in overcoming your situation and obtaining the compensation you deserve. When you work with our firm, you will be working with experienced and aggressive legal representatives who can fight for your rights and pursue the highest amount of monetary compensation available for your unique situation. We take the time to get to know our clients and develop personalized strategies for their legal situations. No case is ever too big or too small of our team to handle! If you have been involved in a serious accident and are dealing with catastrophic injuries, do not hesitate to contact Lenahan Law Firm today and schedule a free consultation with a North Dakota big rig and oil rig lawyer from our team!